26 Floral Blue & White Vase Lamp. Elegantly hand-crafted by artisans in China's Guangdong province, this beautiful piece combines a Song dynasty style porcelain vase with a carved wooden base. The porcelain part of the lamp features a textured glaze sure to add a colorful accent to any room. A fabric shade on a steel frame completes the design. This porcelain lamp features a three-way light fixture that uses up to a 100 watt bulb and includes a soft hand made shade. 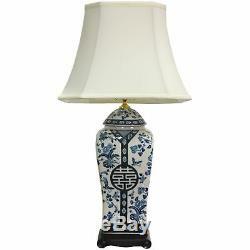 Hand crafted Chinese porcelain lamp. Beautiful hand painted Oriental floral art motif. Includes a fabric shade and built in wooden base. Uses a 100 Watt 3-way medium bulb. 14"W x 26"H. 6"W x 5"D. 6.5"W x 6.5"D.
The item "Oriental Furniture 26 Floral Blue & White Vase Lamp" is in sale since Tuesday, August 15, 2017. This item is in the category "Home & Garden\Lamps, Lighting & Ceiling Fans\Lamps". The seller is "orientalfurniture" and is located in Cambridge, Massachusetts. This item can be shipped to United States, Canada, United Kingdom, Denmark, Romania, Slovakia, Bulgaria, Czech republic, Finland, Hungary, Latvia, Lithuania, Malta, Estonia, Australia, Greece, Portugal, Cyprus, Slovenia, Japan, China, Sweden, South Korea, Indonesia, Taiwan, South africa, Thailand, Belgium, France, Hong Kong, Ireland, Netherlands, Poland, Spain, Italy, Germany, Austria, Israel, Mexico, New Zealand, Philippines, Singapore, Switzerland, Norway, Saudi arabia, Ukraine, United arab emirates, Qatar, Kuwait, Bahrain, Croatia, Malaysia, Brazil, Chile, Colombia, Costa rica, Dominican republic, Panama, Trinidad and tobago, Guatemala, Honduras, Jamaica, Bahamas, Viet nam, Uruguay.